I perfected, in my humble opinion, the brussels sprout!! As much as we love brussels sprouts in this house, it was time to find other ways of cooking them. I kept going back to the default recipe. Saute’ with olive oil and garlic and squeeze some lemon. However, this time with bacon in the fridge I knew it would be a great pairing. I have been using this same lemon dressing to top off swiss chard for years and it was natural to whisk up a small bowlful. Once I slid them into the serving bowl I felt it needed another “color”…purely for presentation, feta cheese! Nice. Bake in oven until crisp, approx. 20 minutes, keep your eye on it. 1/4 cup olive oil + 4 tbs. In a skillet sauté the brussels sprouts in 1/4 cup olive oil until brown and tender, approximately 20 minutes. In a small bowl whisk together lemon juice, pressed garlic, 4 tbs. olive oil and a sprinkle of salt and pepper. 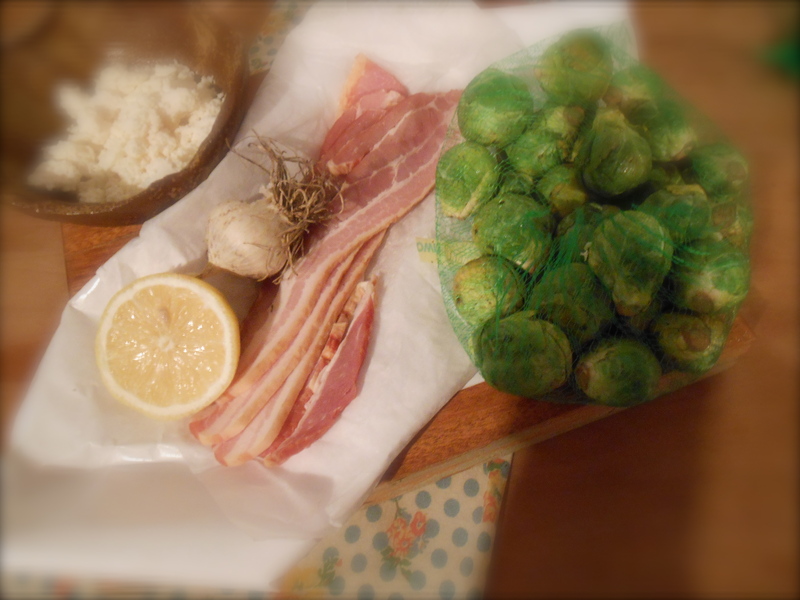 When brussels sprouts are nice and brown add the chopped bacon and combine well. Pour the lemon dressing over and toss. Slide the sprouts into a serving bowl and top with crumpled feta. You are currently reading I perfected, in my humble opinion, the brussels sprout!! at COTTAGE GROVE HOUSE.